With University starting, a whole new life began for each and every one of us. But yes, today was another Movie Day. 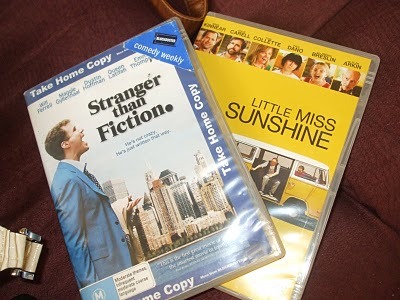 We ended up watching two movies in total: Stranger than Fiction and Little Miss Sunshine. At first glance, I thought this movie was going to be another one of those boring, artistic films that I never found all that interesting. But after watching it, I thought it was really good. How the movie started, the movie plot line and the ending – it all flowed really well in my personal opinion. Albeit, I would’ve liked an explanation of why his life was suddenly being narrated out of no where – but I guess that really wasn’t the whole point in the movie, and it didn’t seem out of place that it wasn’t explained. All in all, I really liked this movie and would recommend it. I didn’t really like this movie that much. I found a lot it rather irritating and frustrating but it did give quite a lot of laughs (which is always a thumbs up in my case). Although, I thought the underlying messaging within this was quite significant. ‘To just be yourself’ and ‘Family is always family’ were what I really got out of it. Both being demonstrated by the various main characters of the movie – especially in the contrast at the end with Olive and the other beauty contestants. However, despite the strong messaging, I wouldn’t want to watch this again, not unless I was really bored. A high school reunion is always good, after all, you don't want to lose your friends. :) Lucky enough for me, most of my high-school friends go to Monash. we should have disney day next! and yeah it was great to see you and everyone again.